Oakland Website Design dictates a professional image to effectively compete with your competition. With a strong and well organized professional design, logical organization and user-friendly navigation, a well-designed website will show your business in its best light and site visitors are far more likely to explore your site, learn about your business, and then contact you to become customers. There are many reasons why WordPress websites are so incredibly popular for Oakland website design. WordPress sites offer tremendous design options and they’re simple for site owners to update and use. Because they’re so popular, there are a large number of companies who offer WordPress themes and add-on application modules. As a result, a WordPress site offers extremely flexibility of design and functionality. And you can update nearly everything yourself. We pride ourselves in developing great looking sites with the ideal features for each customer, generally eliminating the need for custom programming in all but the most unique situation. And WordPress is highly SEO and mobile friendly. In short, it’s easily the best website platform for small to medium businesses, bar none! More than half of all website visitors are now using tablets and smartphones to visit websites. That’s why we develop Responsive Design sites that automatically adapt to the screen size of mobile devices. Whatever device your visitors are using, including desktop computers, laptops, tablet computers, and smart phones, your site will be seen at the appropriate size and with all capabilities available. A responsive design website will shift and re-size images and text as needed, eliminating the need for a separate (and often limited) mobile version of your site. Further, responsive design is Google’s preferred method of providing a “mobile friendly” website. Google gives preference to mobile friendly websites in their search results, making responsive design the clear winner for today’s business websites. We’ve developed e-commerce websites for over 15 years, so we’re familiar with and can recommend a variety of solid e-commerce/shopping cart software, or custom solutions depending on your specific needs. Whether you need to sell a few products on your website or a full-blown online store, we can build the perfect site for you. While we are experienced with many different e-commerce options, we most often recommend WooCommerce, which is by far the most popular shopping cart system for small to medium businesses. It has a very wide range of features and capabilities and integrates as part of a WordPress site, so all the many advantages of WordPress are also true of WooCommerce sites. We also build Magento e-commerce sites for certain larger clients. Magento is the clear leader for very large and high volume e-commerce websites, while WooCommerce provides affordable and competitive functionality for more modest budget e-commerce sites. 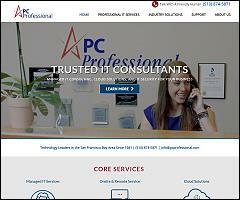 Our Oakland website design customers get consistently strong results from the websites we create for them. In fact, some have told us that their RKS Marketing website is the best thing they’ve ever done to grow their business or organization. That’s because we build and market websites correctly. We’d love to create a highly effective professional website for you.